Preheat oven to 350°F. Place paper liners in 2 (12-cup) muffin tins. In medium bowl whisk together flour, tapioca, milk powder, baking powder, baking soda, and salt. Combine sugar, sugar substitute, and butter in mixing bowl; beat on medium speed until creamy, about 1 to 2 minutes. Add eggs, 1 at a time, with motor running, scraping sides of bowl to incorporate each egg. In small bowl blend milk and half-and-half; reserve. Alternatively spoon flour mixture and milk mixture into sugar-butter-egg mixture; end with flour mixture; mix with spatula just until smooth. In small bowl combine last 3 ingredients; add to flour mixture; mix with spatula just until blended. Carefully spoon batter into paper liners, about 1/4 to 1/2 full. Bake 15 to 20 minutes, or until lightly browned, and centers spring back to the touch. Cool 5 minutes; remove cupcakes to wire racks to finish cooling before frosting. *Note. This recipe was tested using sucralose-based sugar substitute. 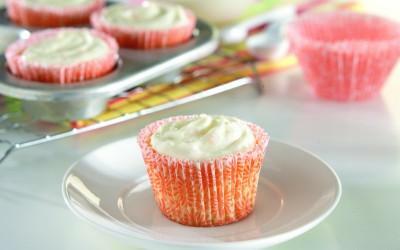 Serving size: 1 cupcake with 1 to 2 tablespoons frosting per serving.